I have been practicing cursive since I was a child but not long ago I was researching how to improve my handwriting and I found that some people use the cursive they call handwriting. I write with my fingers and I really do not know if I'm right or wrong. So I ask you to compare which ones with the advantages and disadvantages of these two writing techniques. The "right" way is whatever works for you. More important than which way you write (using only your fingers/hand or your whole arm) is your overall posture > Sitting upright in a chair that is set right height wise by a desk of proper height, your body relaxed and not twisted or hunched, paper angled in front of you and placed so that your hand and pen fall naturally where they should and your arm feeling relaxed and having room to maneuver. Ok, writing using your whole arm (or more precisely, your upper body and arm) offers more room for movement and is kind of mandatory for certain types of scripts and sizes of writing. 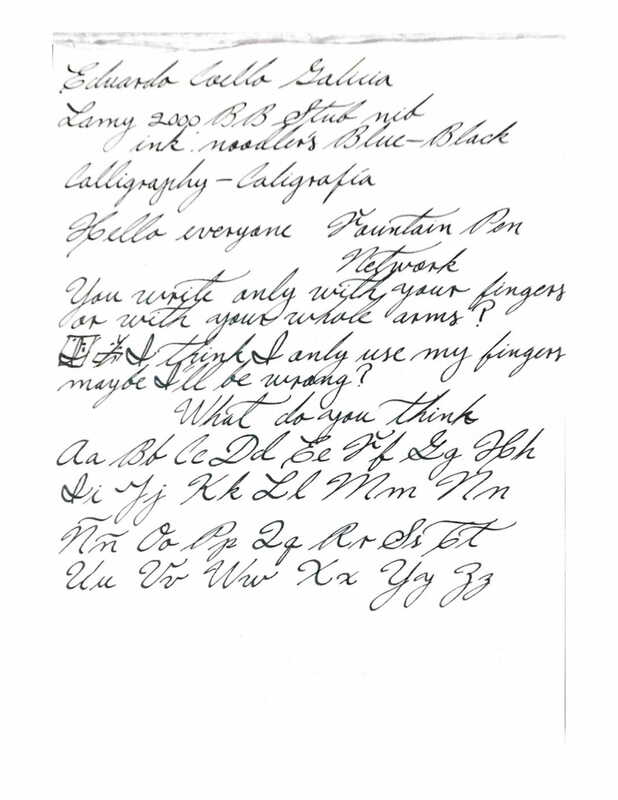 As in, those fluid, large and loopy Spencerian or Copperplate/Roundhand script letters are not achievable if you use your fingers/hand alone. For regular handwriting/cursive using just your fingers/hand suffices well, also, this works better when you are jotting down something "on the move" (i.e. not seated by a desk) to a notebook or somesuch (i.e. to a paper other than larger format loose leaf paper). Oh, it works better for printing also. There are other advantages to using your whole arm as you are using your gross motor skills for the overall movement supplemented by your fine motor skills for the details > should be less tiring. Downsides for the "whole arm writing"? It can take a while to master if you haven't been introduced to it previously (prepare to spend time and effort with it). It will also change the way your writing appears shape and size wise, with practice leading to improvements, such as more controlled writing and letterforms. That said, I write using my fingers/hand only and am quite happy with the appearance of my handwriting/personal cursive script. If the way you currently write has no deleterious effect, and you are happy with the way your writing looks - carry on! I never mastered the "arm" technique. Again, I blame it on being given 2 weeks to learn cursive after moving into a new school district for 3rd grade (I came from a district that used block print in 2nd grade, to a district that apparently transitioned 2nd grade to cursive). The main problem with wrist/hand writing is that long words result in a change in angle of fingers to paper: from \ to | to /. Makes it difficult to keep letters on an even slope. It's not a problem when printing, as one tends to readjust the entire hand for each letter, rather than only for each word. Another advantage of "arm writing" over "finger writing" is over long periods you will have less fatigue doing arm writing. Your curves look smoother if you can write from the shoulder.